Rope tools or wrenches are the lesser known partner to the rope machines. The tools are necessary to make decent rope with the rope machine. This tool can be very simple, like a forked stick for three strand rope, or two pieces of wood attached together into a cross (shown in adjacent photo) for making four strand rope. There must be one strand guideway for each strand of the rope being made. Each strand guideway must be smooth to allow the twisted strand to slide past. I recommend having at least two rope tools available for each rope machine. Rope tools can be made of almost any firm material. Many of the antique rope tools made in the American Midwest were cast iron. Broken cast iron tools are often found at auction. I prefer hardwood, such as Ash, White Oak, Hickory, Mesquite, etc, for making rope tools. Wooden tools are much lighter (even for hardwoods) than the metallic counterparts. The hand grip must be large enough to fit comfortably within your hand. The wooden tools in picture to right are ones I use regularly. 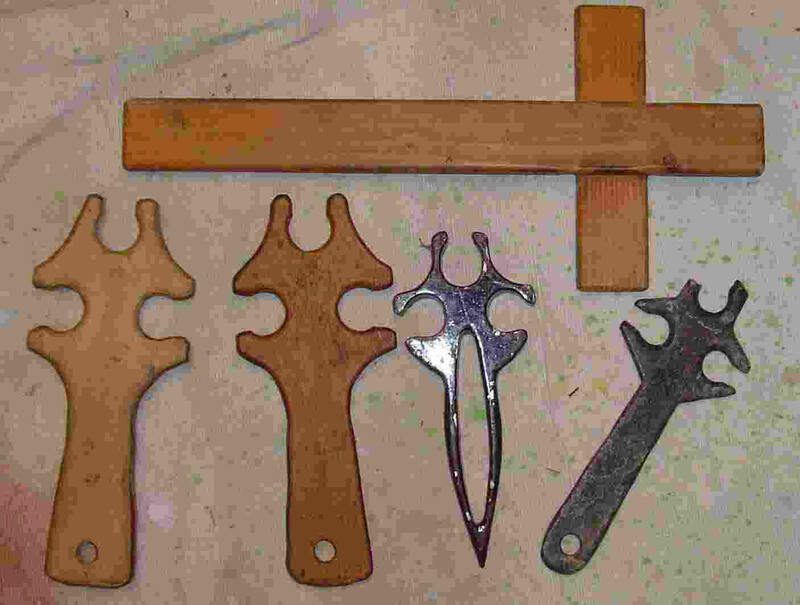 The 3 strand tools are made from plywood. The cross is made of Fir. The metal tools happen to be smaller. The left one was cut from 3/8" steel with a plasma cutter. The one on the right is an antique with broken strand guide. Click HERE for a .pdf file that details making a round headed rope tool, called the lollipop. It starts with a round piece of wood for the head, with slots cut in for the number of necessary strand guideways. A handle is then attached to the head. The handle can then be attached in a radial manner, or angled out to the side, per user desire. Another version incorporates the handle into the piece of material between two of the strand guideways. Make several tools once set up to make one. Spare tools are good to have available when making rope. Fancy crafted rope tools don't necessarily work any better than plain tools. It's all in the eye of the user. Cones and tops are are essentially thicker rope tools that aren't always hand held. Some even self travel down the rope. Contact us for further discussion on the matter. These aren't for the novice rope maker.